Diabetic socks are specifically designed for you if you have diabetes to help protect your feet by offering extra comfort and support. 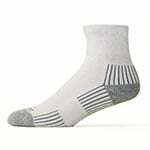 Diabetes socks are seamless which decreases friction between you and your shoe; nerve endings tend to be more sensitive and can be painful with diabetes. Less sock seams also mean a lower risk of blisters which tend to heal more slowly with diabetes due to a possible compromised immune system. Non-Elastic Features: A non-elastic feature helps prevent excess tightness when legs begin to swell. Diabetes often causes leg swelling and fluid build-up especially towards the end of the day. Tight elastic upper bands can cut off blood flow. Proper blood flow is always needed in the healing process in case you have a foot injury. Cushioning Features: Foot injuries need to be avoided with diabetes and extra cushioning can help preserve your feet as it creates a barrier between you and the shoe. Look for cushioning in the heel region if you stand for long periods of time and in the heel and toe if you are a runner or athletic. Standers: People who spend a great deal of time on their feet such as nurses, retail workers, teachers, etc. 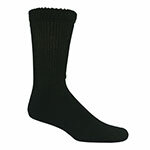 Diabetic socks can help prevent the nagging, ache and swelling of lower legs and feet at the end of the day. Gestational Diabetes: Having diabetes during pregnancy may increase feet and ankle swelling due to increased fluid retention. 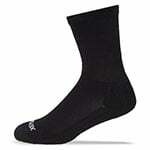 Diabetic socks will prevent constriction and provide added comfort and support. Neuropathy: You may suffer from a diabetes complication which effects nerve endings called neuropathy. Your feet may be super sensitive or experience numbness. You may benefit from the extra padding and protection from diabetes socks which can minimize the risk of foot injuries including tearing of overly, sensitive skin. Decreased Pedal Pulses: Since diabetes and heart disease are closely related, you may have arthrosclerosis or decreased blood flow to your feet causing decreased pedal pulses or blood flow. 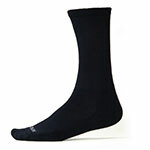 This is a prime situation for foot injury and diabetic socks may add protection. Increased Foot Perspiration You may have a high level of foot perspiration which can lead to a foot fungus called Athlete’s foot and possibly nail fungus. 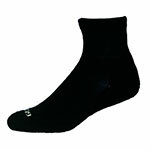 Diabetic socks have a moist, wicking ability which can aid in keeping your feet dry and lessen the risk of fungus. Looking for Comfort: If you have diabetes and are looking for added comfort, without constriction and added protection, diabetes socks are an option for you. 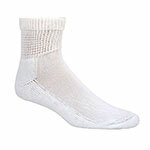 What Are Diabetic Socks Made Of? Diabetic socks are generally made from a combination of fabrics including cotton, merino wool, acrylic, bamboo and spandex for flexibility. 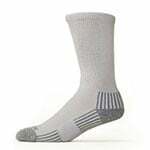 Some diabetic socks also include anti-microbial properties which come from charcoal, silver or copper threading. These can decrease bacteria and the risk of foot fungus. It is extremely important for you to use proper hygiene to maintain the health of your feet and lower your risk of future foot problems. Make sure to wash feet daily with tepid or warm, soapy water and dry carefully with a fluff, soft towel, especially between the toes to prevent foot fungus. Use white, non-fragrant foot cream, salve or lotion on the top of your feet, heels and soles but not between the toes. If you perspire heavily, use cornstarch powder between toes. Put on your diabetic socks and well-fitting supportive shoes. Never go barefoot. You may want to have different socks for sports, home, work and bedtime. Make sure they are always clean and dry for complete foot care.